(Bloomberg) Chrysler Group posted its second straight operating profit as the automaker continues to recover from its 2009 bankruptcy. The announcement was made today by CEO Sergio Marchionne in a call with analysts. He didn't say how much Chrysler earned. Specific numbers will be revealed on Aug. 9. In the first quarter, Chrysler earned $143 million on an operating basis as the company benefited from cost cuts made during its U.S.-steered bankruptcy and subsequent emergence under the control of Italy's Fiat S.p.A. Chrysler's first-quarter net loss of $197 million followed a $2.69 billion loss in the final three months of last year. Marchionne's comments on Chrysler's performance came after Fiat reported a return to a second-quarter profit on higher sales of trucks and agricultural machines. Fiat also said it may raise its full-year forecast. Fiat's second-quarter net income was 90 million euros ($116 million), compared with a 168 million-euro loss a year earlier, the company said in a statement. Trading profit, or earnings before interest, taxes and one-time gains or losses, more than doubled to 651 million euros, beating the 359 million-euro average estimate of 11 analysts compiled by Bloomberg. A recovery in demand for the company's Iveco trucks and New Holland tractors made up for slower sales for cars in Europe after governments ended scrappage programs. Marchionne, who is also Fiat's CEO, is holding back on new models this year as the auto industry emerges from its worst crisis in decades. Fiat confirmed today its forecast for full-year revenue of more than 50 billion euros and a trading profit of 1.1 billion euros to 1.2 billion euros. It is “highly probable” that the guidance could be improved when Fiat announces third-quarter results, the company said. Fiat's board approved the spinoff of its truckmaking and agricultural units before the end of the year. CNH Global NV, Iveco and the some industrial and marine operations will be become a new company called Fiat Industrial S.p.A.
For every existing Fiat share, the owner will get one share in the new unit, which will be listed on the Milan stock exchange before the end of the year. 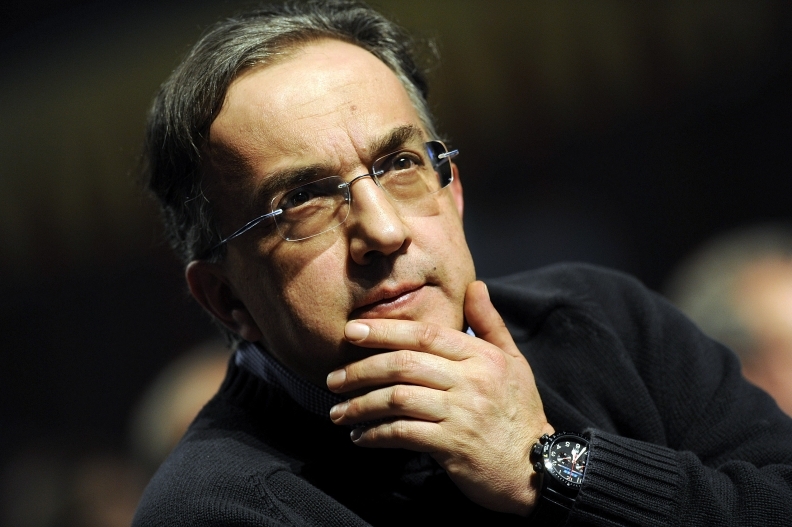 The deal allows Marchionne to focus on Fiat's auto business as there are limited synergies between the two divisions, said Daniel Schwarz, an analyst with Commerzbank AG in Frankfurt. Amsterdam-based CNH reported today its second-quarter operating profit more than doubled to $330 million and said it may raise a full-year forecast later this year. Eight Italian and international banks have offered a 4 billion-euro financing package to help replace inter-company loans and provide working capital, Fiat said today. Net industrial debt fell by about 1 billion euros to 3.7 billion euros during the quarter, Fiat said. Second-quarter revenue rose 13 percent to 14.8 billion euros, beating the average estimate of 13.3 billion euros by analysts. Trucks sales rose 18 percent, while revenue from construction and agricultural equipment climbed 16 percent. Auto sales rose 6.7 percent. Deliveries of passenger cars fell 12 percent to 455,100 in the quarter, led by a slump in demand in Germany and Italy. Light commercial vehicle sales rose 30 percent to 99,200, helped by the Doblo and the Fiorino. Fiat said it expects improvement in all of its operations in the second half except the auto business, as demand is still hurt by the discontinuation of government incentives. European auto sales fell for a third consecutive month in June, led by Fiat, Ford Motor Co. and Toyota Motor Corp. Fiat recorded the biggest June decline among the major manufacturers, with sales falling 20 percent, according to the European Automobile Manufacturers' Association. Volkswagen AG, BMW AG and Daimler AG's Mercedes-Benz have boosted sales this year on surging demand in China, the world's largest auto market. A rebound in demand for premium models has benefitted the luxury carmakers and largely bypassed Fiat, whose best selling cars are lower-priced compact models such as the Punto and the Panda. Fiat “is continuing to apply the rigorous cost- containment discipline” that was introduced during 2008, the carmaker said in its statement. Fiat this year is equipping more of its cars with reduced- emission Multi-Air engines, rolling out a 500-model subcompact with a new 2-cylinder engine and beginning sales of the Giulietta hatchback under the Alfa Romeo brand. Cooperation with Chrysler is slated to include both companies' use of the Giulietta compact platform as the basis for new models. Chrysler will provide its Italian partner with a sport-utility vehicle this year as well as five more vehicles for Fiat or its Lancia division in 2011, according to April presentations on Fiat's website. Second-quarter earnings were helped by a stronger U.S. dollar and Brazilian real against the euro, which translate into higher sales when converted back into the local currency.